The Federal Government promotes homeownership as a way to achieve the American Dream. One of the justifications for this long-standing policy is the belief that buying a house provides one of the few avenues for low-income families to accumulate wealth. The downturn in the housing market and the rise in foreclosures in the wake of the 2008 financial crisis, however, call for a reassessment of whether, in fact, homeownership helps low income families build wealth. Buying a house provides one of the few ways for low-income families to build wealth. But, there are times when renting can be a better option. There has been consistent bipartisan support for homeownership in the United States. Current federal tax policy gives special preferences to owner-occupied housing through the mortgage interest deduction and capital gains exclusion. Furthermore, local land use policies allow single-family homes to be built in more locations and with fewer restrictions than apartment buildings, which are more likely to be renter occupied. Owner occupied housing units accounted for nearly two-thirds of all occupied housing units in the country as of 2018. The preferential tax treatment of homeownership tends to favor wealthier families rather than low-income households who are more likely to use a standard deduction instead of itemizing homeownership-related expenses on their taxes. However, the federal government has sought ways to make homeownership more accessible to low- and moderate-income households by passing laws intended to increase lending to low-income households: in particular, the Community Reinvestment Act (1977) and the Federal Housing Enterprises Financial Safety and Soundness Act of 1992 (the 1992 GSE Act) see here. One reason for the federal support for low-income homeownership programs is the belief that homeownership provides an important way for families to build wealth (see here pp. 225-57). For most homeowners, especially those at the lower end of the income scale, their house is their largest asset. Monthly mortgage payments that increase a homeowner’s equity in their house is a form of forced savings. In addition, rising house prices represent an important means for increasing family wealth, particularly for low-income households. But owning a house also entails financial risk. On average, U.S. house prices tended to rise in the decades before the 2008 financial crisis. However, house prices saw dramatic declines during and in the years immediately following the financial crisis. There have been wide variations in the recovery between different regions of the country and different housing markets. In fast-growing and space-constrained metropolitan areas such as San Francisco and Seattle house prices (in inflation adjusted terms) are at or close to what they were during the mid-2000s peaks. In places like Chicago, Detroit and Cleveland, real home prices hadn't recovered to their pre-2000 levels by the end of 2018 (see here). These declines can result in “under water” mortgages where the value of the outstanding mortgage exceeds the value of the house. And when the holders of a mortgage foreclose on a loan, the homeowner loses whatever equity may have been built up in the house. Has homeownership in fact helped low-income families build wealth? In our research we have analyzed whether low-income families that owned their house built more wealth than those that rented. A direct comparison of wealth accumulation between families that owned homes and families that rented does not account for the many potential differences between these two groups. A better comparison is looking at households of renters and comparing changes in wealth accumulation that take place between households that shift from renting to owning and those that remain renters. 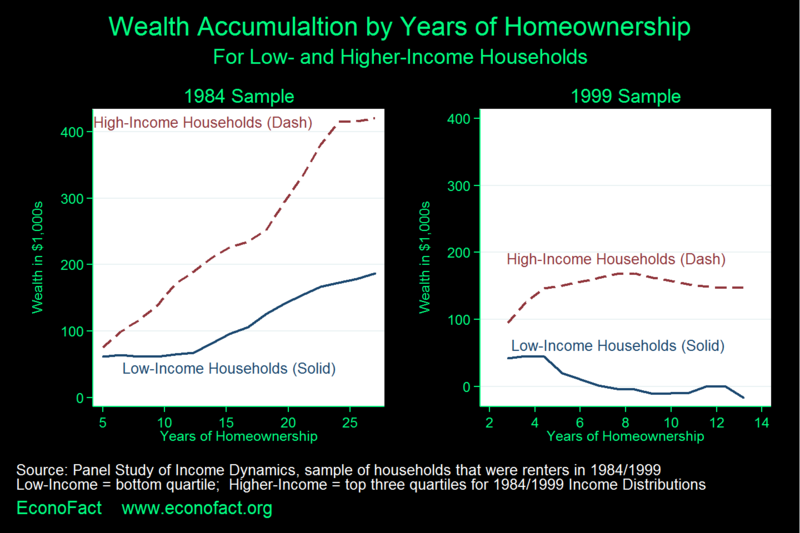 We find that homeownership does not consistently contribute to wealth accumulation for low-income families. Low-income households that were renters in 1984 and first purchased a home in 1989-1999, a period of relatively stable real house prices, experienced significant gains in wealth as of 2011 compared to households that remained renters. These increases in wealth occurred for both low-income and higher-income families, although the richer families saw more of a proportional increase (see right panel in chart). The picture is different, however, in the case of households that were renters in 1999 and first purchased a home in 2001, 2003 or 2005. The period represented by the left panel of the figure encompasses the Great Recession that began in 2008. Low-income households that first purchased a house between 2001 and 2005 had lower wealth accumulation by 2013 than those that continued to rent. The wealth accumulation of higher-income households was also lower in the later period than in the earlier period, but it was nonetheless positive in both cases. More specifically, low-income households that first purchased a house in 1989, 1994, or 1999 experienced a $6,800 annual gain in real wealth on average (in $2013), whereas low-income households that first purchased a house in 2001, 2003, or 2005 showed negative annual wealth gains compared to the wealth holdings of renters. There are several reasons why low-income households do not enjoy the same wealth accumulation through homeownership as higher-income households. One reason is that low-income families tend to own their homes for shorter periods of time than higher-income households. This occurs since low-income households are more susceptible to receiving predatory loans that lower home equity through fees, poor underwriting, high penalties which raise the risk of default and foreclosure. Low-income households tend to pay higher monthly mortgage payments as a fraction of their income than higher-income households and have lower savings. This means that low-income households are more susceptible to being forced out of their homes since unexpected events like job loss or large medical bills may make it impossible for them to make their mortgage payments on time. Other reasons beyond using housing as a vehicle for building wealth may justify government involvement in the housing market. Homeownership may have benefits that extend beyond the families that purchase a house to the broader community in the form of increased exterior maintenance; household and neighborhood stability; and more civic engagment, among others (see for instance here and here). In addition, there is some evidence that homeownership conveys benefits to children which potential buyers do not necessarily have in mind when making a purchasing decision. And it has been argued that improvement results that stem from homeownership are particularly valuable in low-income areas (see here). Government involvement may also help promote liquidity in the mortgage market, especially in times of economic downturns, and help extend credit to underserved groups that have historically suffered from discrimination. There are arguments for expanding home ownership among low-income households that are not linked to wealth accumulation, such as greater links to a community, although the evidence on this is mixed. Our research supports that the claim that homeownership is an effective way for low-income households to build wealth is only true when the housing market is relatively stable. Homeownership did not contribute to wealth accumulation for low-income families whose first house was purchased in the years before Great Recession. But this was an unusual episode, and it is more likely that there will be greater stability in the housing market going forward. Considering this, and given widening income inequality, our view is that the Federal Government should continue to support homeownership as a means of wealth accumulation for low-income households, especially by providing assistance so that low-income homeowners can stay in their homes since foreclosure cuts off their main source of wealth accumulation; rising home equity. Still, it also needs to be made clear that there are times when owning a home can be worse for wealth accumulation than renting for some low-income households.